Creative Nails wishes you a very Happy Navaratri! 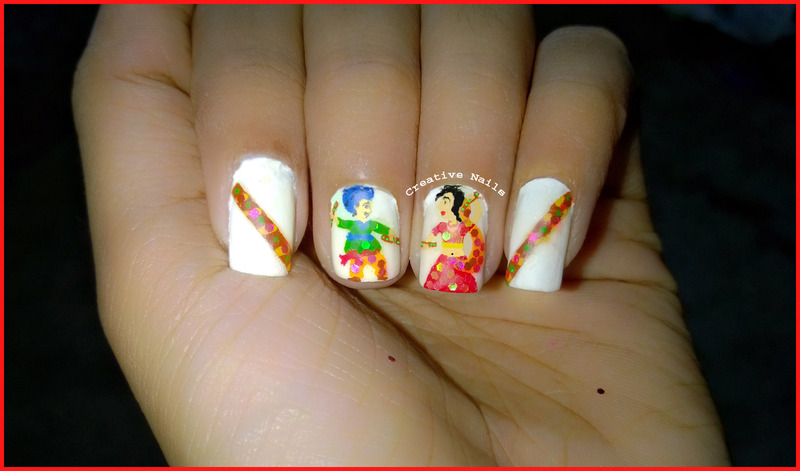 As a part of Navaratri Creative Nails have arranged “Dandiya Raas” on nails! The Dandiya Raas dance is performed in Goddess Durga’s honor. This dance form is actually the staging of a mock-fight between Goddess Durga and Mahishasura, the mighty demon-king. This dance is also nicknamed ‘The Sword Dance’. The sticks of the dance represent the sword of Goddess Durga. The women wear traditional dresses such as colorful embroidered choli, ghagra and bandhani dupattas (traditional attire) dazzling with mirror work and heavy jewellery. The men wear special turbans and kedias, but this varies regionally. During the dance, dancers energetically whirl and move their feet and arms in a complicated, choreographed manner to the tune of the music with various rhythms. The dhol is used as well as complementary percussion instruments such as the dholak, tabla, bongos and others.